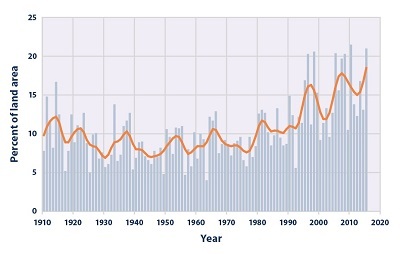 ﻿ Fun Easy English - Environment - Global warming - Climate change Indicators: Heavy Precipitation. The percentage of land area experiencing much greater than normal yearly precipitation totals increased between 1895 and 2015. 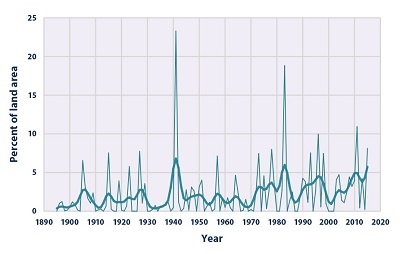 There has been much year-to-year variability, however. In some years there were no abnormally wet areas, while a few others had abnormally high precipitation totals over 10 percent or more of the contiguous 48 states’ land area (see Figure 2). For example, 1941 was extremely wet in the West, while 1982 was very wet nationwide. Figures 1 and 2 are both consistent with other studies that have found an increase in heavy precipitation over timeframes ranging from single days to 90-day periods to whole years. 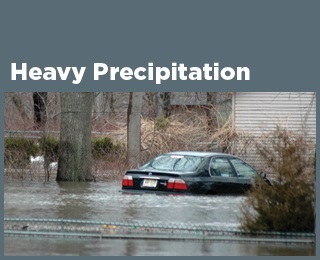 For more information on trends in overall precipitation levels, see the U.S. and Global Precipitation indicator.